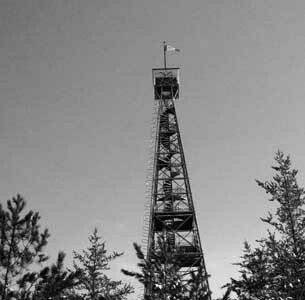 Photo (Web) Fire towers in the early years were flimsy wooden affairs. Over the summer of 1944, dad took a job with the Saskatchewan Forest Service as an observer at one of the hundreds of fire towers that had been erected throughout Northern Saskatchewan, this one above being similar to the one dad worked near Meadow Lake. After that one summer, we often returned to Meadow Lake for the yearly Stampede. Mom repeatedly called: “Hoo hoo, Harold, where are you? Hoo hoo, Haarooold.” There was no answer and she was more than worried. At three and a half, I was always running around outside playing, but when mom hadn’t heard me for a while she went out to see what I was doing. She knew that dad was in the bush cutting wood and sometimes he would take me along, but would always told mom first. She probably thought I was into some kind a mischief which would not be far off the mark for a three-year-old. Mothers! So trusting of their little boys! Photo: This photo copied from a Cater and District “Least we Forget” series of stories found in my mothers files. 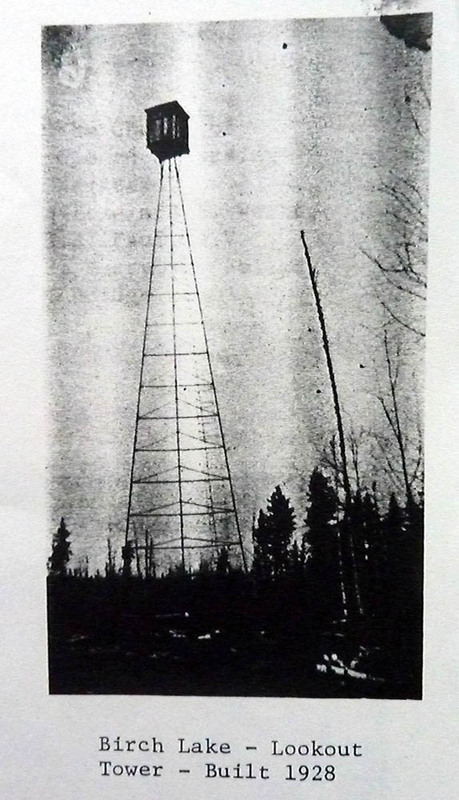 The tower at Meadow Lake was very similar to the Birch Lake Tower (L). The ladder to the top can just be discerned on the right side. It is hard to believe this structure was capable of holding the small lookout shelter built on the top, to say nothing of when a line squall with gail force winds passed through the area. “Louise was sleeping and when I couldn’t find you after a few minutes, I became worried. I called and called but you didn’t answer. Finally I could hear this faint little voice: “…..here mom..!” It was so faint I could not figure out where on earth you were. I walked further back along the path that led to the fire tower and continued to call. Your answers came back a little louder, but still distant …. ‘up here mom….’. When I neared the clearing by the fire tower I looked up and there you were about 50 or 60 feet off the ground on the open ladder. I was petrified. In the few months we had been at the Ranger Station, I had never climbed that open ladder to the top. I tried a couple of times with Dave, but only got up about 15 feet before I had to come back down. Over my objections, your Dad had taken you to the top several times. You would climb the ladder ahead of him and between his arms. I could never watched as I was petrified. I told him to even tell me when he was taking you up otherwise I would be worried sick. Even at the top there was no railing that would stop a three year old from falling over the edge. Now, when by yourself and watching you hang on to the open rungs, I stood there frozen. I had no idea what to do and was just starting to climb the ladder when, by chance your father came walking down the trail. He had heard me calling and came to see what was happening. He looked up, saw you and began to calmly climb. He never said a word and I was beside myself thinking you might slip and fall before he could reach you. Dave just kept climbing until he reached your perch; then, not stopping, he told you to just keep climbing until you reached the top. There were never any half measures with your dad. If my dad never missed an opportunity to teach me a life skill, Mom did the same thing. Even when I was young she would always ask my help in preparing meals, working in the kitchen, helping with her garden and flowers or when picking wild berries. She was a berry picking fool just like her mom and sisters. She always did everything in a loving and caring way that made a child feel eager to help. I suppose her nurturing manner of teaching as lead to my lifelong love of cooking and gardening. That she was an excellent cook and gardener made it just that much better to have her for a teacher. The same experience awaited my baby sister when she became old enough to help. Late that fall when the fire season was past, we all returned to our homestead at Birch Lake and Dad was hatching some new plans. Shortly after our return, he told mom we were leaving for Cold Lake where he was going to work in a logging camp. He said a neighbour, Fred Fraser, had asked him to bring his team of horses and work the winter at a camp on the Martineau River twenty or thirty miles north of Cold Lake. A deal was struck and in late October, just before Louise had her first birthday, we were on our way to Alberta. From what I learned in later years, one reason Dad was probably in such demand for these jobs was not only was he a very hard worker, he was also an expert horseman and woodsman. During those early years, horses were still kings of the forest part of logging and dad was the king of kings. Mom’s younger brother, my Uncle Tonnie (Wheeler), who was just 16 at the time, decided to travel with us on his first big adventure away from home. Uncle Toni was to become my favourite Uncle as I grew through my early years. “Tonnie was just as adventurous as your dad. He was fun to be around and everyone loved him for his good humour and friendliness. Even though you might not remember, you used to follow him like a little puppy. One day, we all piled into our old car which was packed with as many belongings as possible. You can’t imagine how hard it was to decide what to pack and what to leave behind. It was good your Aunt Irene and Cousin Joyce moved back in to look after things while we were away. Once loaded with two children and our own personal belongings, there was not much room for extras. Dad promised to get more things when he came back to get the horses and sleigh later that fall. I had everything packed that I wanted him to bring as heaven knows what he would have picked on his own. Tears welled in mom’s eyes as she thought about her baby brother and other family, of her first home, her babies and husband. It must have been very hard leaving her little log home on Birch Lake, an area where her life had been anchored in family and friends for nearly 25 years. Also left behind were her gardens and plants which she had nurtured with such tender, loving care. Leaving behind such things was to become an oft repeated event in mom’s life over the next fifteen years. Although I have no direct memory of that trip to Cold Lake, my mother’s memories of those times well over half century later, were nothing short of spectacular. 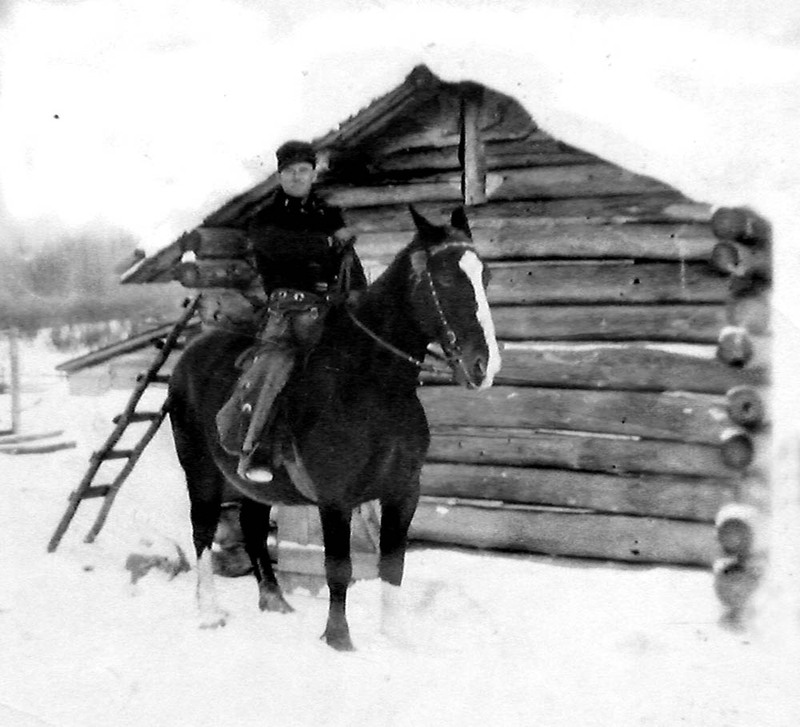 Photo: 1943 – This is a winter picture of dad on his horse at our Birch Lake farm. We left for Meadow Lake in the spring of 1944. Mom never knew what finally became of our little log house and the farm. She knew that Aunt Liz and her three younger children had moved in for a period around 1944 after her son had passed away and while her husband was in hospital. Also, Aunt Irene and her daughter Joyce periodically lived in the house when not away cooking at a various jobs around Alberta. I also learned that our family had traveled back sometime January or February of 1945 to bring Aunt Liz and her children to Cold Lake. Aunt Liz got a job working in the restaurant at the Bellview Hotel with her sister, my Aunt Irene, so was able to begin a new life away from the heartaches that followed the deaths of her beloved husband and son. We traveled back to the old home place a few times but, after a couple of years memories of our first family home faded into history. Mom believed the property was likely sold off for back taxes as had happened to the original McNeill homestead and so many other homesteads during those difficult times. One day I hope to trace the property titles back in the 1930s and 40s to see what transpired. For the McNeill family, Dave, Laura, Harold and Louise, the Martineau River Logging Camp would be the third of many moves over the next ten years as dad continued his search for a place in the sun. This is the concluding Chapter of the Birch Lake and Glaslyn series from the early 1940s. The arrival of the McNeills, Wheelers, Dewans, Roskes, Davids and others in the late 19th and early 20th Century will be explored in a future series. Next up, our family arrives at the Martineau River Logging Camp on the north side of Cold Lake. What great stories! So many names you mention ,I remember my dad talking about. He was very good friends with Marge and Albert. He used to talk about Irene lots. When we moved back from Powell River in 1956 we lived in Tart Dewan’s old log house for 2 years until dad got lumber from logging on the island to build new. I remember dad taking me to what he called the Dave McNeill place to see where he and mom lived when they were first married. It was a very beautiful yard site. You speak of your dad looking for his place in the sun. Well my dad must have gone to BC looking for that too however he hated the rain so came back to Sask. to eek out a meagre living on the rocks of Birch Lake. However I have good memories there. I used to ride my horse like the wind and spent many days riding checking cows and sheep on the island. Don’t know if I would have wanted it and different.